Tinctures have been formulated out of just about every herb you can think of for about as long as we have recorded history. From the Ancient Egyptians soaking tree herbs in alcohol to the very popular “Warburg’s tincture” that was sold across the U.S. throughout the 1800’s. To create a CBD tincture, herbs are placed in an airtight vessel (usually a glass jar) that is filled with alcohol to aid in the CBD extraction process. The vessel is set aside (after a few good shakes to get things moving and started) in a cold, dark place for several weeks, agitating each day, and BOOM…you’ve got a tincture. These elixirs, are “potent” because of the alcohol content and, therefore, troublesome when administered to children. It was discovered, in efforts to help children, that the medicinal effects of the tincture could be achieved by simply holding it under the tongue for a short time. Tinctures, by definition, contain the alcohol that was used to extract the medicinal properties from the selected herbs. Many CBD oil extracts labeled as “tinctures” are not actually tinctures, but fat-bonded extracts. With the modern invention of the Vacuum purge oven, we’re now able to “purge” (fully extract out of a solution) the alcohol from CBD tinctures to make oils and extracts that are free of alcohol. This is the technology that Ambary Gardens, and many CBD manufacturers, use to extract CBD oils. CBD that is properly extracted, and bonded with an oil, allows the human body to absorb it as easily and naturally as possible. Many of our customers are surprised to learn that CBD is created naturally in human mothers and this CBD is bonded within her breast milk. To mimic this, in the most organic way possible, we bond our CBD with MCT coconut oil in our Full Spectrum CBD Extract Daily line. This means that your body will efficiently utilize the extract without having to hold CBD tinctures under your tongue, contrary to what you may have heard. So, if CBD extracts do not contain alcohol (and are therefore not really tinctures), why are people putting them under their tongue? It all comes back to the terms we use in the hemp industry. Over the years, anything with a dropper-style bottle has been blanket-labeled as a “tincture,” even though many of them do not contain alcohol in any way. This led to a general “put it under your tongue” mentality for any product in dropper-topped bottles. You’ll see many people in CBD Oil Facebook Groups and elsewhere recommending this “under the tongue” dosing…often inaccurately. Unless there is alcohol in the remedy, it is absolutely not necessary to hold it under your tongue. 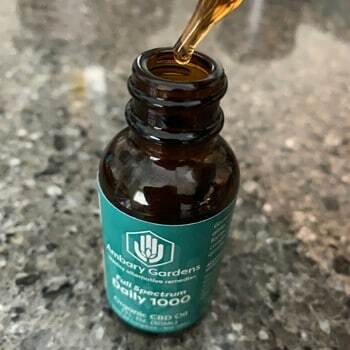 Ambary Gardens “CBD Extracts” are accurately named, because of the lack of any residual alcohol, and therefore, do not need to be held under the tongue. Most CBD “tinctures” are really CBD extracts and can be ingested directly. So… what’s the best way to take my CBD oil? We always advise knowing exactly what is in your CBD oil. You can (and should) obtain 3rd party testing results on the cannabinoid content of the products you’re considering so that you understand what you’re buying and the best way to ingest the remedy. If you see ethanol or alcohol listed as an ingredient of your favorite brand, you know the product is a CBD tincture and you should put it under your tongue for 5 minutes or so. As of this writing, to the best of our knowledge and research, there are very few CBD products on the market currently, that actually contain ethanol or any kind of alcohol. If, when you check the ingredients, you see that your CBD extract is indeed an oil, and contains some kind of fat, then the product is most likely best used as a swallowed dose to allow your body’s digestion to do its work. Fat-bonded forms of oil can indeed be used under your tongue, but it takes much longer than a traditional tincture (around 15 minutes). Please, always keep in mind that everyone’s body is different, and everyone’s individual need for CBD is so different that it’s impossible to tell up front. It’s always best to start with a low, comfortable dosage for yourself, and increase if you see the need for it. Questions about using CBD for health and wellness? Shoot them over in comments and we’ll get back to you as soon as we can. Thanks for your question, Nancy. Our products are all Farm Bill compliant, which means every product we make is at, or below, 0.3% THC content. The THC in our products isn’t considered to be, in any way, an active ingredient. It is just one part of the many, many cannabinoids that the female hemp plant produces and are therefore contained in our full spectrum oil. If you have further questions, please feel free to call 855-426-2279 and one of our CBD Specialists will be happy to help you. If the oil is swallowed and not held under the tongue, does it still bypass the liver? How is it different than capsules? Hello Liz! Great question. Since our Daily formulas are not designed to absorb through the mucus membrane in the mouth, they do indeed utilize the liver for digestion. If there is any difference with the oil and the softgel’s, it would be that the liquid is a bit easier of a process for the body. Same wonderful full spectrum extract and same MCT carrier in both. Thank you!